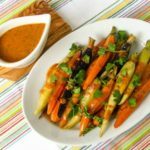 A recipe for rainbow carrots cooked on a grill and served with a cilantro chile drizzle. Combine the cilantro, chile, garlic, rice wine vinegar, lime juice, honey, and oil in a food processor and process until emulsified. Season with salt to taste. Transfer to a jar with a lid. The drizzle will keep, covered, in the refrigerator for up to 1 week. Prepare a hot fire on the indirect side of your grill. Place the carrots in a 9 X 13-inch disposable aluminum pan, drizzle with olive oil, and salt to taste. Recipe reprinted with permission from THE GARDENER & THE GRILL © 2012 by Karen Adler & Judith Fertig, Running Press, a member of the Perseus Books Group.